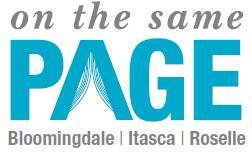 What's New @ Roselle Public Library: Be "On the Same Page" with your Library! Be "On the Same Page" with your Library! Mark your October calendar now for "On the Same Page," a month-long reading event presented by Bloomingdale, Itasca and Roselle public libraries, featuring F. Scott Fitzgerald's The Great Gatsby. Check out the brochure for book discussions, movies, and programs at each Library.